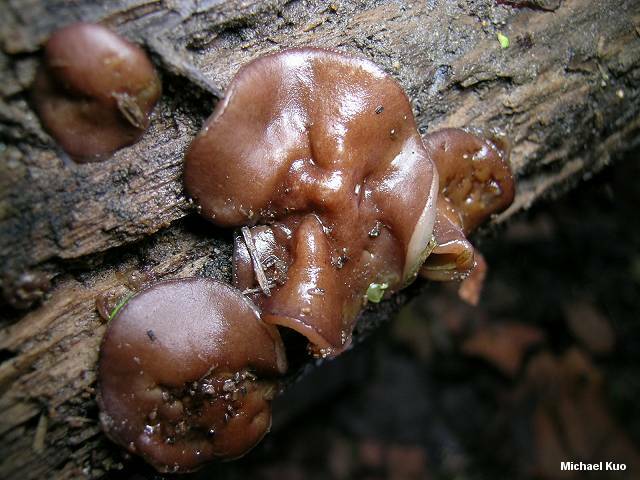 Recorded from Michigan, New York, and Illinois (and now Kentucky, if I have identified it correctly), this rubbery brown cup fungus requires microscopic analysis to separate from the more commonly collected Pachyella clypeata. While Pachyella clypeata has smooth spores, the spores of Pachyella punctispora, as its Latin name suggests, are stippled with warts. The warts, however, are not large (separating Pachyella punctispora from Pachyella adnata, which has warts measuring over 1 µ). Ecology: Saprobic; growing alone or in small groups on rotting wood (primarily the wood of hardwoods) that is usually water-soaked; spring, summer, and fall; distribution uncertain (recorded from Illinois, Michigan, and New York by the author of the species; my collection was made in eastern Kentucky). Fruiting Body: To 3 cm across; cushion-shaped when young, soon becoming saucer-shaped or shaped like a flattened cup; broadly attached to the wood so that only the edges can be lifted away from the substrate; upper surface sticky when fresh, medium to dark brown, often with hints of purple, smooth or wrinkled, fading with age; without a stem; flesh somewhat rubbery or gelatinous when fresh. Microscopic Features: Asci with bluish tips in Melzer's reagent; 400-450 x 19-25 µ. Spores 21-25 x 12-15 µ; with one or two oil droplets; stippled with tiny warts (unmeasurable with light microscopy); in my collection the warts visible with a 2% KOH mount as well as with tap water and with Melzer's Reagent. Excipular surface with a few thread-like elements that do not create a palisade. REFERENCES: Pfister, 1973. (Pfister, 1973.) Herb. Kuo 10150401. Kuo, M. (2006, April). Pachyella punctispora. Retrieved from the MushroomExpert.Com Web site: http://www.mushroomexpert.com/pachyella_punctispora.html.